______________________________________________________________________________________________________________________________________ JEFF BRANDT ON TV Jeff had just finished filming two television shows which will be airing November 30th! One will be on Missouri Public Television for the Ronald McDonald House in Joplin, Missouri and the other will air the same day on Springfield TV KOZL from his recent performance on Branson Country USA filmed live at the Grand Country Music Hall in Branson, Missouri! Hope you can TUNE IN! JEFF WILL BE ON KCWI TV IN DES MOINES! The great people at KCWI have asked us to join them, Thursday August 28th for the Great Day program! 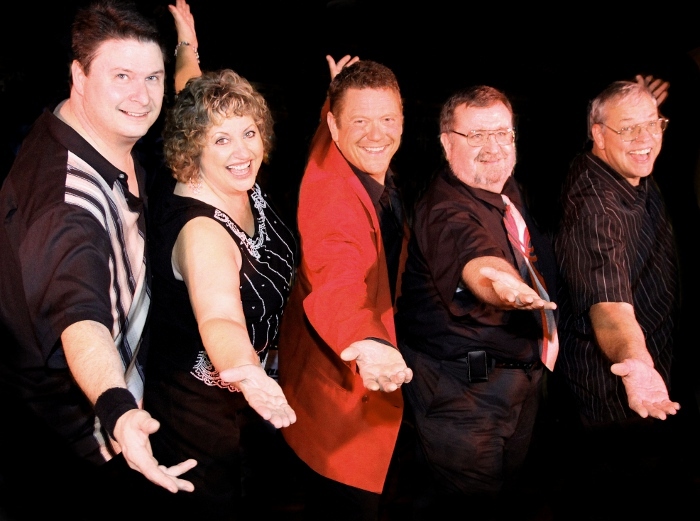 This is to talk about our upcoming 35th Anniversary Show at the Lake Robbins Ballroom on August 29th! We are so honored and are really excited about this! they post the video online so if your not in Iowa you can still watch it!! Thank you Rachel and Mike and KCWI TV for asking us! MORE EXCITING NEWS FOR JEFF BRANDT AND GALAXY!! we are doing a big concert event at the Lake Robbins Ballroom in Woodward, Iowa to celebrate!! We also just found out that we have been nominated again this year to be inducted into the Iowa Rock 'n' Roll Hall of Fame!! You can add your nominations for the band buy filling out the online form by following the link below! Even if you have nominated us in the past, you can do it again. Any information you dont know on the form just put NA. We would really appreciate it!! 2014 Entertainer of the Year!! 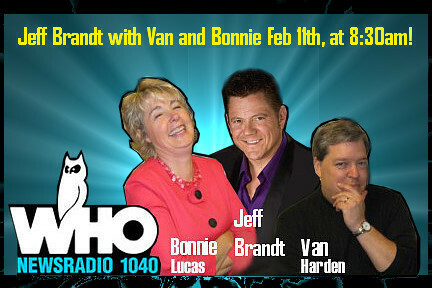 Jeff is very excited to be on the air with Van and Bonnie on WHO Radio in Des Moines, Iowa!! at South East Polk High School in Des Moines on February 14th at 6:30 PM!! by going to http://www.whoradio.com/ on February 11th at 8:30am CST. Hope you can tune in and look forward to seeing YOU at the concert! Information on the Valentines Day Concert is directly below! Jeff Brandt and Galaxy in Des Moines! Cellist Carolyn La Marchina, and Violinist Mary Kay Moore, with a special appearance by Kaethe and Michael Brandt!! Tickets are on sale now by calling (515)265-6254!! Proceeds to benefit the South East Polk Band Boosters Organization! Help keep the music alive in our schools!! 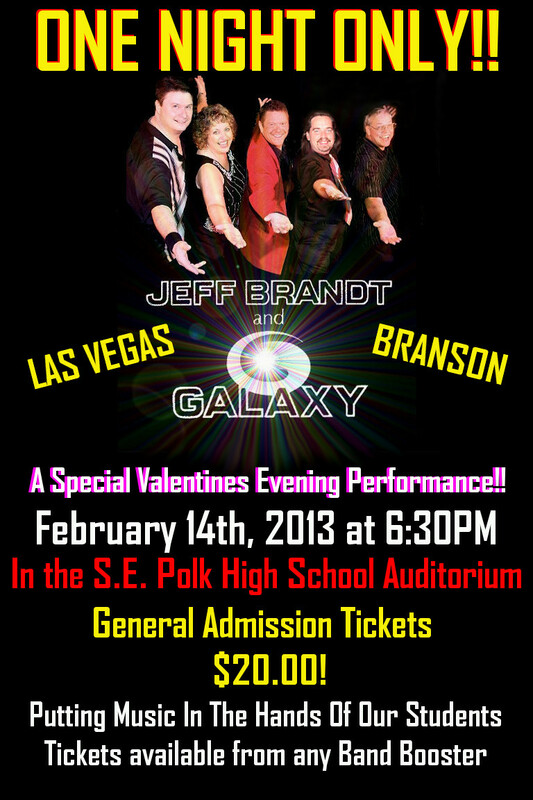 JEFF BRANDT AND GALAXY IN CONCERT!! 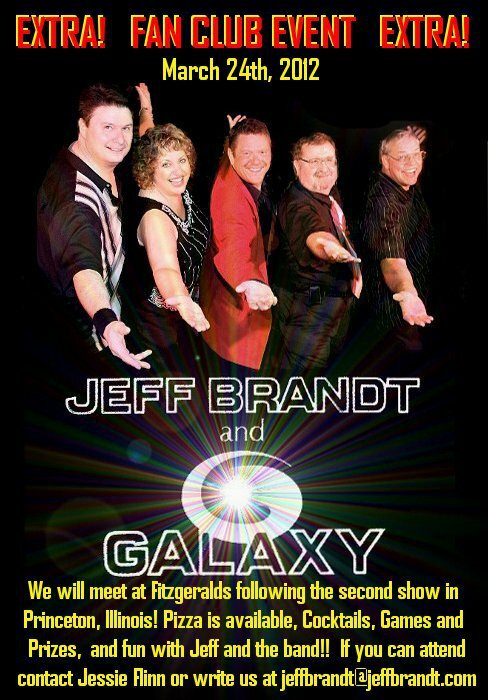 Jeff Brandt and Galaxy are coming to Galesburg, Illinois January 20th, 2013!! The performance will be held at the Galesburg High School Auditorium in Galesburg, Illinois Sunday January 20th! 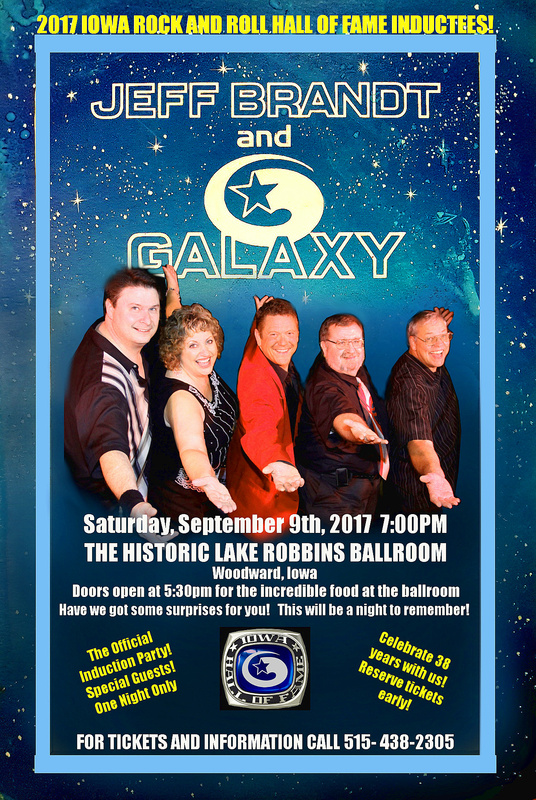 We hope to see you there for an awesome evening with Jeff Brandt and Galaxy in support of Christian Action Ministries Food Pantry!! Everything is set!! 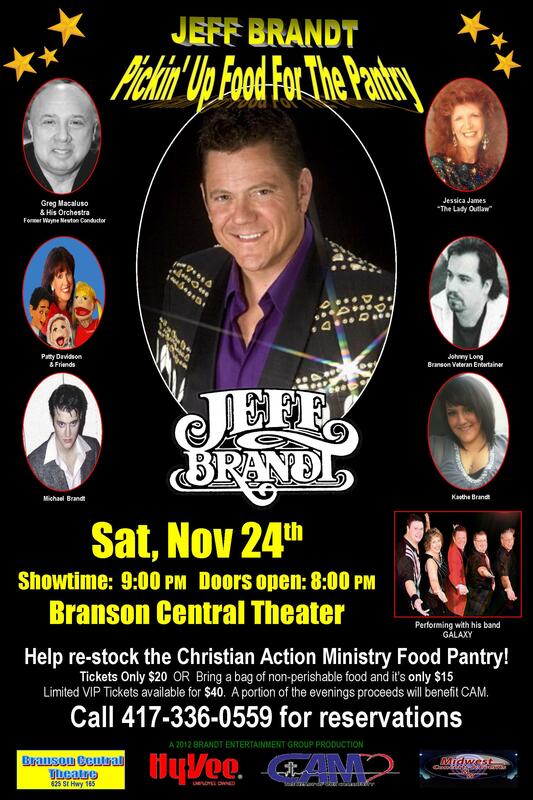 The date...Saturday, November 24th at the Branson Central Theatre. Thats Thanksgiving weekend. 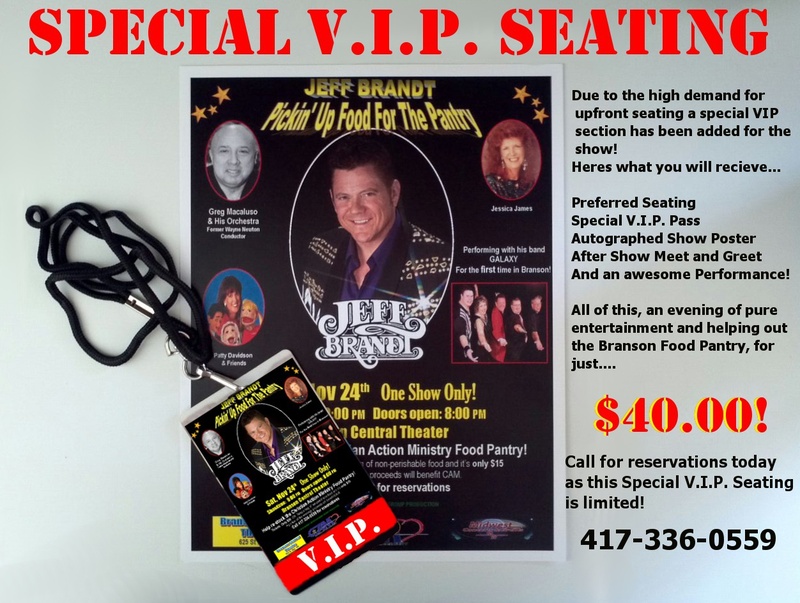 Spend Thanksgiving with family and friends and then head for Branson for some great shopping at the area malls on Black Friday, the fantastic Christmas lights all over town, relax Friday night then get ready for a Saturday night of fun with Jeff Brandt and Galaxy and some vng special guests!! We are excited to announce that along with Jeff Brandt and Galaxy, we will be joined by Greg Macaluso (previously the conductor of the Wayne Newton Show) and his Orchestra! Featuring Violinists Jamie Macaluso, Mary Kay Moore, Cellist Carolyn La Marchina and more!! Special guest stars Jessica James, Patty Davidson and Johnny Long are scheduled to perform!! Jessica James, a beautiful female vocalist will accompany Jeff on a Kenny Rogers and Dottie West duet in the show!! Patty Davidson, an amazing ventriloquist will fill the room with laughter that night and Johnny Long will astound you with his fantastic vocals!! We are also very excited to announce that Michael and Kaethe Brandt will both be taking the stage to perform for you! 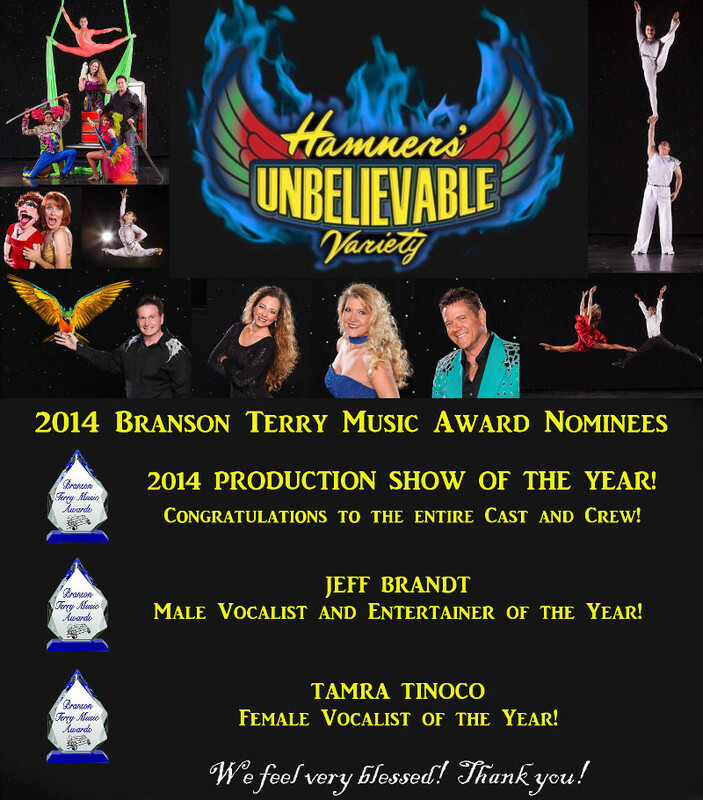 This will be the first time ever that the entire Brandt family will be together on stage in Branson and they have some very big surprises for you!! You dont want to miss this exciting evening of entertainment! All of this is coming together to help out the Christian Action Ministries to fill the Branson Food Pantry which is in great need of food and monetary donations. We want to thank our friends at the Springfield Hy-Vee Food Store for thier great generosity to help us do just that!! Keep watching our website or send a friend request to Jeff Brandt on facebook! For advanced ticket sales call (417)336-0559 _____________________________________________ Gods greatest to you and yours!! ***********************************************************************************************XY IN BSON!! This is going to be so much fun!! Jessie Flinn is doing double duty on this event and we couldnt be more excited. information to her. We just need an idea of how many to people to expect. Gods greatest to you and yours!! 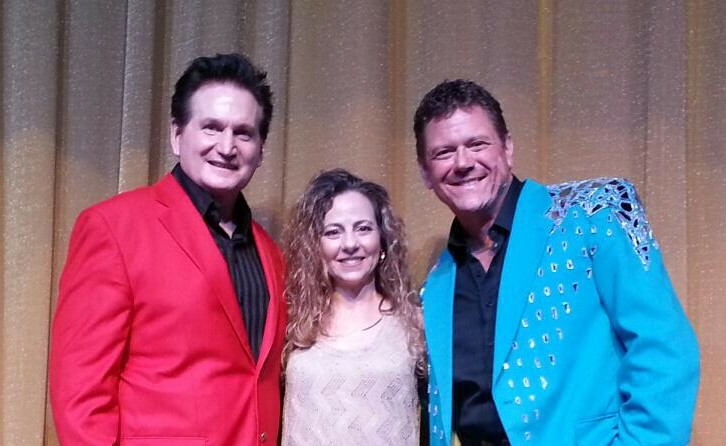 We had a wonderful time performing in Aurora, Missouri last night! We were made to feel so welcome by the Aurora Chamber of Commerce and Shannon Walker. A special thanks to Gary Bartlett as well for all of his help and friendship. Gina and I were also very honored to have the opportunity to meet and visit with Senator Jack Goodman. We truly had a terrific night and thanks to all for making us feel so welcome! NEW JEFF BRANDT AND GALAXY ROAD DATES!! March 24th, 2012 ... Princeton, Illinois ... Princeton High School Auditorium. This is a two show date with shows at 2pm and 7pm.